Soften a small ball of wax and apply to your finger. Using water, spread the edges to blend into your skin. Using the edge of the spatula, make a cut in the wax — not too deep. 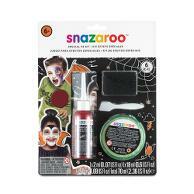 Use the stipple sponge to dab red face paint or cake blood onto the wax. Drip some Gel or Theatre Blood into the cut and let it run down your finger!